Metro significantly relaxed its policies on extended hours for the Washington Capitals' run to the Stanley Cup Final, including extending service for Thursday night's series win, WTOP has learned. WASHINGTON — Metro significantly relaxed its policies on extended hours for the Washington Capitals’ run to the Stanley Cup Final, including extending service for Thursday night’s series win without ever planning for any cash to change hands, WTOP has learned. In fact, Thursday night’s extended service was part of a trade between the Caps and Metro that Metro valued at $100,000, Metro spokesman Dan Stessel said in an email. “Metro has been looking for a space in the region capable of holding several thousand people for an employee meeting, and would have incurred associated expenses to do so. Now, Capital One Arena will be that venue in exchange for the extra hour,” Stessel said. Under Metro’s standard policy, the group that pays for extended service also gets a refund for any fares paid after the system would normally have closed. “There is no credit back based on ridership in the extra hour under this particular agreement,” Stessel said. 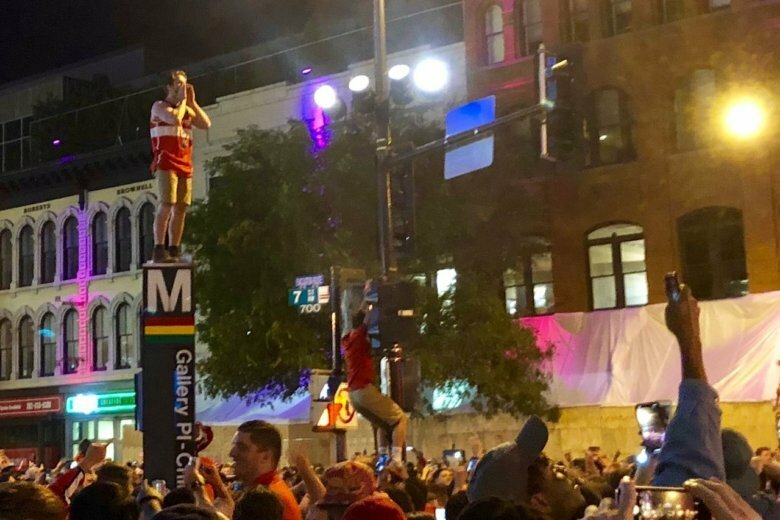 On Thursday night, when the Capitals won the Stanley Cup in Las Vegas, 35,644 people entered the Metrorail system after 11 p.m., Metro said in a tweet Friday afternoon. The transit agency declined to provide a breakdown of how many of those riders entered after 11:30 p.m., during Metro’s extra 90 minutes of rail service that ran through 1 a.m.
Metro had promised the system would stay open until at least 12:30 a.m., but decided to keep trains running until about 1 a.m. to help remaining crowds get home. Metro also relaxed other parts of its policy on extra hours of service for other games in the series. Typically, groups that reach an agreement with Metro for additional service must put a deposit down upfront; however, Metro did not require any deposits for any extended service during the Capitals run to the Stanley Cup Final, Stessel said in an email. Revised requirements issued last year normally call for the $100,000 deposit two weeks ahead of an event for each extra hour of service. Instead, Metro is billing each of the other groups that agreed to pay for the extended service for Capitals playoff games after the fact, Stessel said. The two-weeks advance notice and upfront deposit is normally required so that Metro can adjust track work and other schedules. “We have not required advance deposits for the postseason Caps sponsorships, in recognition of the tight time constraints,” he said. Comcast is likely to get the largest discount since it promised to pay for the extended service for Game 4 of the Stanley Cup Final when, like Thursday night, thousands of fans squeezed into a sea of red to watch the game on outdoor screens. Metro did not immediately have ridership totals available for Monday night’s game.